Allview launches SmartCare, the smart scale that allows complete body composition assessment. 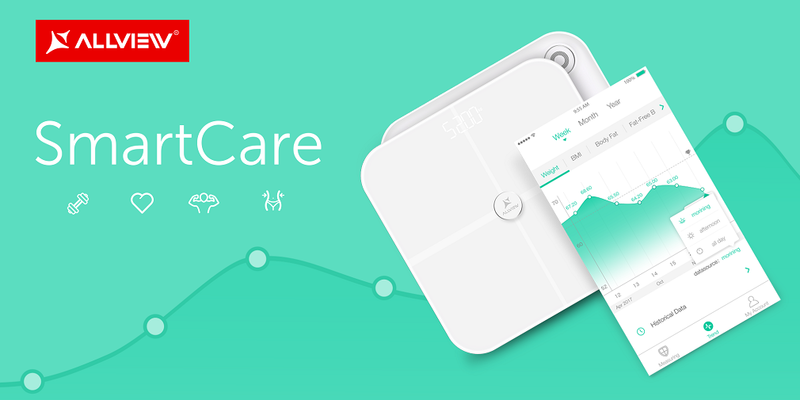 Using the SmartCare scale and dedicated SmartCare app, the users will monitor their lifestyle and health status over time. Thus, according to the data sent by the scale, the users will be able to choose a daily program of physical activity and choose a suited diet. The SmartCare scale takes into account 14 key values, including body mass index, fat percentage, muscle mass, bone mass or metabolic age. All of the indicators are sent via Wi-Fi to the dedicated app, which automatically generates useful graphs in assessing the physical shape and health of the user. These charts provide weekly, monthly and yearly monitoring, based on user preferences. The SmartCare scale is ideal for the whole family, allowing multiple profiles setting (up to eight individual profiles). The accounts are visible in the app for each member of the family, and the scale will detect the user and generate all the values associated with his profile in the dedicated account.